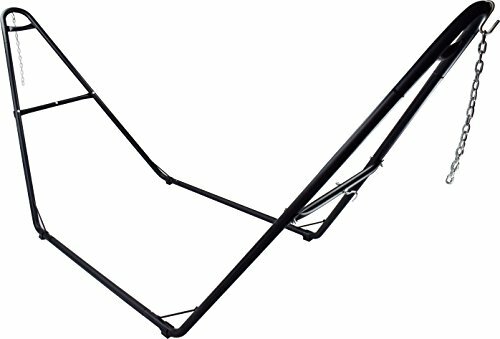 This universal stand holds your favorite hammock so you can lounge around all season long. The Sorbus Universal Multi-Use Steel Hammock Stand is a great way to support your favorite hammock. No more drilling hooks into the ceiling or searching for the perfect tree to hang your hammock! This freestanding frame is portable and the ideal way to relax on any flat surface. As an attractive display to any indoor/outdoor space, it features a versatile A-frame with adjustable chains and s-hooks that modify to your hammock of choice (not included). Complement with various hammock styles (Mayan, Brazilian, Camping, and more) while lounging in the yard, patio, or poolside. The possibilities are endless. If you like switching out hammocks depending on the season or style, this is the perfect alternative hammock option! Assemble your hammock stand within minutes! Joints lock together with snap button mechanisms. No special tools required. Hardware and Instructions INCLUDED. Made from sturdy powder coated steel construction. Weather resistant. Please note: Hammock Stand Frame ONLY! NO hammock included.